I think we are on the same page. Except, you are talking about the class in which Khajiit is the top DPS. Liko, @susmitds , streamers all got the same result with Khajiit in being the Templar DPS. The very same testers got very different results in MagNB. susmitds even rated Khajiit being the top templar DPS and I read in some post, he stated that one of his raid teammates got like 500 higher DPS on khajiit stamplar compared to orc/dunmer in 4.3.1. Khajiit was the BiS new Templar DPS on both Mag/Stam Templar before these changes. Your mistake is thinking Magplar DPS = magicka DPS in general. it is not though. Yet again, I find myself saying that I have also recalculated my parses to represent a non-Templar parsing scenario, (converting 190% Crit Damage down to 180% is a simple algebraic formula), and Khajiiti were still at the top. Of course, this does not factor in that Nightblades (and Sorcerers with Bound Aegis) get an additional 8% Magicka, so the story there is definitely going to be different, but Khajiit still remain, undeniably, near the top for those classes. I chose Magplars to test in because they struck the balance between familiarity, rotation replicability, and damage. I recognize that they do have additional Critical Damage and have made it clear that those numbers do not factor in actual class differences, serving only as a quick calculation from which to draw conclusions off of without having to completely redo my whole setup from the ground up. Not to mention, one of my friends have taken inspiration from my old spreadsheet style and have created her own for Magsorcs and Magblades, inviting two of her friends to parse and fill those sheets out. Bear in mind that these numbers were from 4.3.0, the tests were done by human hands, the testing scope was smaller, and some of the testing data was incomplete. I did not do this testing; I only had a hand in the methodology. The results seem to be varied. The Magicka Sorcerer parses had Khajiit second to Altmer, but the Magicka Nightblade parses had Khajiit absolutely smoking the competition, which is kind of funny, though not too surprising considering that Magblades also have the same Critcal Damage passive. Keep in mind, this was in 4.3.0; Khajiit have been buffed for 4.3.2. All in all, there's really nothing conclusive I can say until I do my own Magsorc and Magblade parses, and unfortunately, I am not able to script Magsorc Crystal Fragments procs since those are governed by RNG, and my scripts are prone to missing one or two light attacks once every two parses so I can't make Magblade bow procs consistent. In the end, I have made no such mistake. I recognize that classes have different scaling for different stats, but the most accurate testing I can do can only be on Magicka Templars as of now. I agree on most points with you in your latest post @HatchetHaro , but I still think you overestimate Khajiit and underestimate Argonian performance. Not everything in this game must be broken down to raw numbers or a DPS net gain. I already have numbers to prove that Khajiiti performance is substantially higher than any other Magicka race, and Argonian performance is far too low. Breaking things down to raw numbers is the best way to prove it in a controlled environment, and I can tell you this: a DPS net gain is always going to be more desirable than any utility differences because utility differences can easily be replaced through speccing differently but any DPS difference is completely lost, not to mention that the grand majority of this game consists of players playing DPS. You’re still highly overestimating the consistency of Khajiit because bad RNG in the execute phase can account for a lot of lost dps if you’re running one or more Bloodthirsty. And you are still understating the importance of Breton race-based sustain for mag builds especially when the CP scalings are implemented. 3 Elemental weapon casts on an 8s parse makes the difference even more apparent. Investing into sustain more than minimally becomes surplus on Breton, so of course they can invest nearly everything into damage and max stats where other races cannot. 490 effective+total recovery as compared to a Dunmer’s gold food 371 (even an Altmer’s gold food) is obviously quite far ahead. It’s the difference between having to use an extra Recovery Glyph or being able to run another Infused Spell Damage Glyph. But being able to run blue food also means they will come out ahead even more when the new CP scaling come into play. Because being able to run double max stat foods without losing sustain is going to be incredibly strong. That is 1.4k extra health, and 1.5k extra mag, both further increased by new CP scalings, all while still having the same or more spell damage due to not needing to slot a recovery glyph and/or use Infused Absorb Mag where other races do in order to have the same sustain capabilities as a baseline Breton. The raw damage does not matter if you are running out of resources to use abilities, and in many cases, in many groups, even good ones, you will not have perfect sustain support to carry an Altmer or Khajiit’s mediocre sustain through fights that go long. Khajiit is strong if you use Shadow and are lucky. Crit statistics can normalize during a fight but they can also have swings of bad rng during Major Force uptimes, or get unlucky and not crit while you can stand fairly stationary and complete your rotations comfortably thus causing a chunk of dps loss. Sure with every modifier Clockwork regen can match a Breton’s baseline sustain values, while lacking ~1680 hp and ~1800 mag (scaled only for cp), and lacking a ton of resistances. With high Warhorn uptime the differences get bigger. Pretty much this, Pretty clear that Khajiit would be very good on templar both magic and stamina. This not only explain the Khajitit buff but the reorganizing of Orc and Dunmer. Max resources get more important. Yes this is lower than the error margin. Just to clarify your last point, the vast majority of players are DPS because that is how the game is designed. 67% of spots on a trial roster go to DPS. 50-75% of spots on a dungeon roster go to DPS. I know people get defensive at that statement, but there is a reason why it happens this way. 3 Elemental weapon casts on an 8s parse makes the difference even more apparent (180 effective regen). Investing into sustain more than minimally becomes surplus on Breton, so of course they can invest nearly everything into damage and max stats where other races cannot. You are complaining about variance. If you are complaining about Khajiiti having inconsistently lower parses due to unlucky crit, you are not factoring in Khajiiti also having inconsistently higher parses due to lucky crit. Variance does not affect the average values. In the end, given enough time to dps, it will always go to the average. If you have time to talk about bad RNG, you have time to talk about good RNG, and those cancel out perfectly. Trust me, I've done the maths. You have misread the Magplar rotation from Alcast. You have included the starting abilities into the rotation itself, and in this case, you have taken what is supposed to be a 9s segment of ability casts and shoved it in an 8s rotation. No one casts Blazing Spear twice in one rotation. This alone already messes up your credibility, but sure, let us go with that, shall we? 8s rotation, Blockade > Barrage > Spear > 5x Ele Wep: an actual usable rotation. And instead of just going for theoretical numbers because it is painfully obvious that you have not obtained any real numbers, here are some real numbers, taken directly in-game on PTS v4.3.2. Strictly solo, 5/1/1 Zaan, P. Siroria, Spell Strat, full Magicka Enchants with Infused on big armor pieces, 1 Infused 2 BT on jewelry with full Spell Damage enchants, Khajiit and Breton, Khajiit on Gold food, and Breton on Blue food. Let's go. Templar Magicka Scaling: Inner Light 5%, Mages Guild 2%, Undaunted Mettle 6%, CP 20%, for a total of 33% extra max Magicka. Basically, you're only looking at a difference of 800 Magicka after the CP scaling. About 1% damage difference, 1.2% tops; not going to topple Khajiiti anytime soon, that's for sure. So, basically, Khajiiti on Gold food have 30 - 32 less Magicka Drain per second than Bretons do on Blue food. What a surprise! Actually, it is not; it is why I had to use Spell Symmetry once in each of my Breton parses and none in my Khajiiti parses. "You’re still highly overestimating the consistency of Khajiit because bad RNG in the execute phase can account for a lot of lost dps if you’re running one or more Bloodthirsty." False. You did not account for the exact same chance of good RNG which also gives the exact same amount of gained dps. Once more, variance does not affect the average. 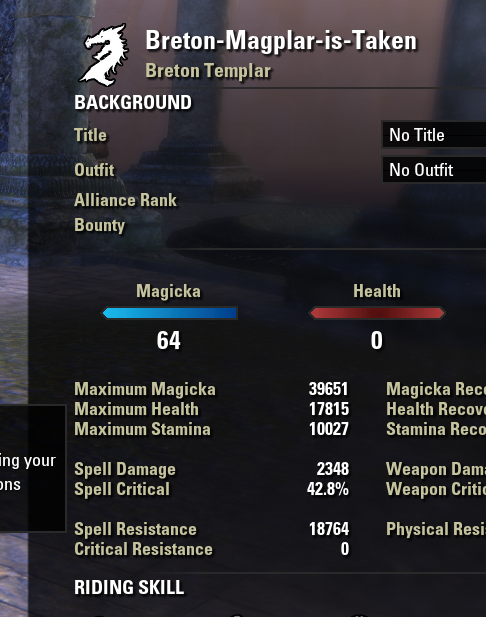 "You are still understating the importance of Breton race-based sustain for mag builds especially when the CP scalings are implemented"
False, because I've just proven that Khajiiti on Gold food have less Magicka drain than Bretons do on Blue food, and let us be real here, this rotation is a massive Magicka sink. Also, the CP scalings do not affect sustain; they only affect the max Magicka pool, and as I have just calculated, it's really not a lot. "The raw damage does not matter if you are running out of resources to use abilities, and in many cases, in many groups, even good ones, you will not have perfect sustain support to carry an Altmer or Khajiit’s mediocre sustain through fights that go long." False, because in good groups you have access to Worm, a lot of Orbs, and the fights either last only 2 minutes (Mantikora, Ra Kotu, Zhaj'hassa, Varlariel) or there is sufficient downtime for you to regain your Magicka during the fight (vAS, vCR). Basically, in the end, you have no idea what you are talking about. EDIT: Oh hey look in a surprise to no one my CP calculations are correct. Exactly. There is far more emphasis on DPS than there is on the utility roles. Shoehorning certain races into the small number of utility roles is just not fair to those races. If those races wouldn't be able to fulfill other roles I'd agree. But every race can fulfill every role and succeed with it, even in veteran content. The only time they might have issues is for leaderboards or stuff like that where your entire "character composition" matters until the very end. For 99% of the game that's not the case though and that's why it's okay to have "utility" races. All in all the truth is that .2 version with all of its controversy is looking much better than the mess we have right now on live. Just a little tweak here and there and good to go (talking about magicka btw). What parses are you reading on earth? yea. And some of the tests I have seen are perfect raid buffs or specific gears for some but weird hear loadouts for others, but the difference in dmg is still high four zeros worth of dmg for of all the races lol. The small difference between the "OP" selections is balance in my book and much better than live for sure. Exactly and this is the most important aspect. ZOS really achieved something outstanding and I am very pleased by the outcome. Who honestly would have thought that ZOS can balance something right? You gotta wait a while until I (and my assistant) can find the free time to do it. I'll try do the testing this Tuesday afternoon but no guarantees. I also have plans for even further testing on different classes, so that'll take up Wednesday and Thursday as well. I'm definitely free Friday so there will definitely be an update then. Thanks alot for all the work you put into this! Do you plan on doing a new one for the new kitty racial? This does not contain any conclusive data. All these are single parses on each race, and that combined with the randomness of Minor Vulnerability as well as self-supplied Off Balance from the Lightning Staff backbars makes the accuracy of the data from this video questionable at best. I haven't seen any concluding data from you that puts Altmer not on top after the 4.3.3 changes. I mean after the Khajiit changes your emphasis on their crit chance isn't a thing anymore and that was the only reasoning you had for Altmer not being on top. Bretons were never parsing ahead of Altmer. 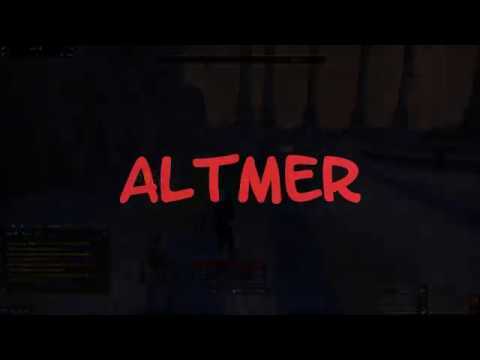 So my point still stands, Altmer are the top pick for Magicka DPS, we had this conclusion in 4.3.0, 4.3.2 and even now. At least until there are parses that prove otherwise. You haven't seen any because I haven't posted any. I actually have a lot of work to do and it is really difficult to find the hours upon hours upon hours of time just testing and collecting data on the PTS. I've never claimed anything for 4.3.3 just yet but just because I haven't done the testing doesn't mean I have to accept the results from others regardless of their accuracy. I've claimed Khajiit to be on top for 4.3.0 - 4.3.2 because my testing showed that. There were no such claims for 4.3.3. So cut it out. Your point may "still stand" but your point has nothing to do with me as of now. Wait until I complete my testing, then we can talk. Oh I did not want to disregard your efforts. That was never my intention. I appreciate all the time and work you put into this. We have another round of 4.3.3 parses from the guy who did it before (and which you seem to doubt) and the results are as expected, Altmer still rocking while Khajiit now is falling behind (not much though). Bretons are still nowhere near the top. Bretons are still nowhere near the top. The Breton advantage won't show up on a 3 mil parse. Altmer has more burst damage and it takes a minute or two for Breton to catch up, after the Altmer has wasted time throwing a heavy attack or two. The Breton advantage is there in long fights. I have no problem with that. Which race is marginally #1 doesn't concern me. What concerns me is that one race got stuck with a useless trash passive that has absolutely zero utility to their primary PvE DPS role. You also have to understand that results depend on methods used. Testing with identical gear and CP gives you a superficially "controlled" test, but it doesn't reflect in-game conditions. We gear up differently based on what the race needs. In practice, people will put an Absorb Magicka enchant on Altmer backbar, and a Flame/Frost/Shock (for for single target) or Berserker (for better AOE) enchant on Breton backbar. That would more accurately show the performance difference we can expect on live. I think OP in this thread used blue food on Breton for the same purpose, but not all testers are doing so. You also have to understand that results depend on methods used. Testing with identical gear and CP gives you a superficially "controlled" test, but it doesn't reflect in-game conditions. We gear up differently based on what the race needs. In practice, people will put an Absorb Magicka enchant on Altmer backbar, and a Flame/Frost/Shock (for for single target) or Berserker (for better AOE) enchant on Breton backbar. That would more accurately show the performance difference we can expect on live. And that's exactly how most of the parses are done? Even on 6m parses Bretons are not pulling ahead. Updated with PTS v4.3.3 results. I had Stamplar, Stamsorc, and Magsorc planned, but that would quadruple the time I spend on the PTS, which is already a lot.